Leslie Osman Goodman was born March 26, 1904, in Lyons, Burt Co., NE, and died January 17, 1960, in Rapid City, Pennington Co., SD, at age 55. Buried in Bear Butte Cemetery, Sturgis, Meade Co., SD. He is the son of Jesse Monroe Goodman of Northboro, Page Co., IA, and Alice Mae Speakman of Northboro, Page Co., IA. Jessie is buried in Pleasant Lawn Cemetery, Geddes, Charles Mix Co., SD. A Goodman Infant (1912 - 1912) is also buried there. Emmett Alonzo Goodman is buried in Black Hills National Cemetery, Sturgis, Meade Co., SD. Olive Sophia Nelson was born March 8, 1910, in Dixon Twp., Gregory Co., SD, and died September 7, 2010, in Ferndale, Whatcom Co., WA, at age 100. Buried in Evergreen Memorial Gardens, Vancouver, Clark Co., WA. She is the daughter of Clarence Cornelius Nelson of Rockford, Winnebago Co., IL, and Edith Christina Larson of Farmington Twp., Waupaca Co., WI. 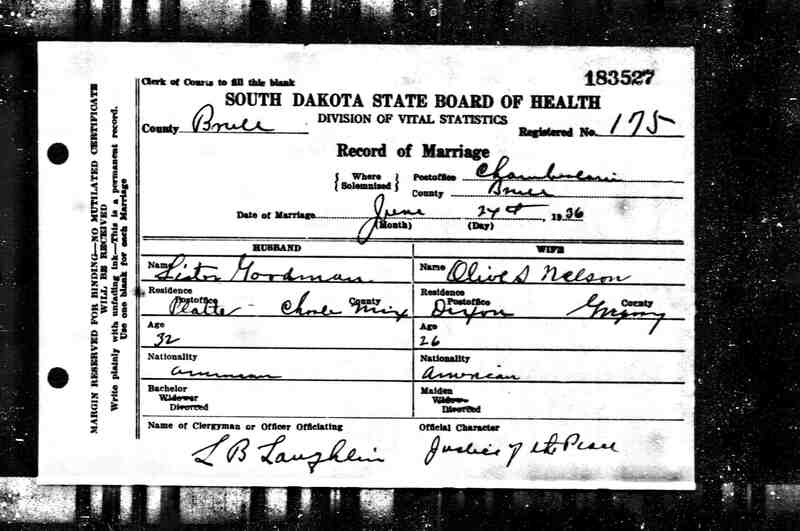 Leslie Osman Goodman and Olive Sophia Nelson were married on June 24, 1936, in Chamberlain, Brule Co., SD. Darril Eugene Goodman: Born September 25, 1937, in Geddes, Charles Mix Co., SD; Died October 23, 2012, at Gila Regional Hospital, Silver City, Grant Co., NM (age 75). Buried in Mountain View Cemetery, Lordsburg, Hidalgo Co., NM. Married (1) December 25, 1960, in Socorro Co., NM, to Alma Nadine Taylor; Born June 4, 1936, in Quemado, Catron Co., NM; Died November 13, 1995, in Lordsburg, Hidalgo Co., NM (age 59). Buried in Mountain View Cemetery, Lordsburg, Hidalgo Co., NM. Married (2) November 21, 1998, in Unknown, to Edna Ruth (Robertson) (Hix) (Owens) Green: Born August 18, 1934, in Warrensburg, Johnson Co., MO; Died October 3, 2002, at Gila Regional Medical Center, Silver City, Grant Co., NM (age 68). Buried in Mountain View Cemetery, Deming, Luna Co., NM. Married (3) Unknown, to Sarah Kamalangoneb Unknown: Born Unknown. Marjorie Vonita Goodman: Born October 30, 1939, in Iona Twp., Lyman Co., SD; Died June 22, 1943, in Hot Springs, Fall River Co., SD (age 3). Buried in Evergreen Cemetery, Hot Springs, Fall River Co., SD. Vonita Darlene "Vonnie" Goodman: Born August 17, 1945, in Sturgis, Meade Co., SD. Married November 23, 1967, in Unknown, to Thomas Lyle "Tom" Davidson: Born May 13, 1933, in Unknown. Lived in Austin, TX. 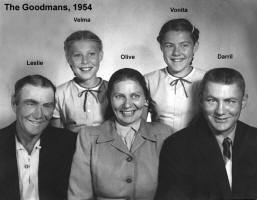 Velma Leona Goodman: Born August 2, 1946, in Sturgis, Meade Co., SD. Married to Clyde Buford Fraley: Born January 20, 1943, in Elliott Co., KY. Lived in Ferndale, WA. After Leslie Osman Goodman died, Olive Sophia (Nelson) Goodman married LeRoy Lloyd Lull. Leroy Lloyd Lull was first married to Francis May. 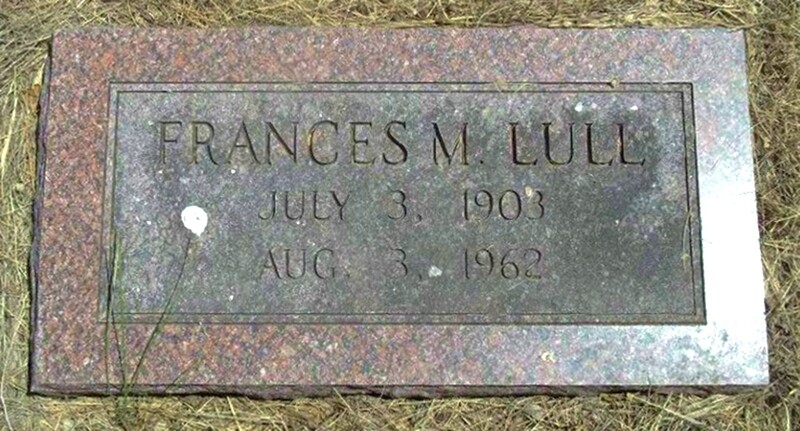 Francis May was born July 3, 1903, in Rich Hill, Livingston Co., MO, and died August 3, 1962, in Belle Forche, Meade Co. SD, at age 59. Buried in Beulah Cemetery, Beulah, Crook Co., WY. She is the daughter of Roy May of Missouri, and Emma (Unknown) Circle of Missouri. LeRoy Lloyd Lull and Francis May were married about 1926 in Unknown. Martin V. Lull: Born February 17, 1930, in Jenkins Twp., Crook Co., WY: Died June 15, 2000, in Homelake, Rio Grande Co., CO (age 70). Married to Elizabeth M. "Betty" Kelling: Born February 2, 1931, in Iowa; Died June 12, 1991, in Monte Vista, Rio Grande Co., CO (age 60). Betty was a Registered Nurse. 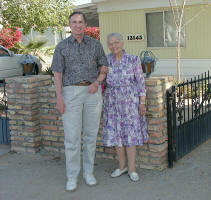 LeRoy Lloyd Lull and Olive Sophia (Nelson) Goodman were married April 25, 1963, in Tonasket, Okanogan Co., WA. LeRoy Lloyd Lull and Olive Sophia (Nelson) (Goodman) Lull had no children. Following the death of LeRoy Lloyd Lull, Olive Sophia (Nelson) (Goodman) Lull married Fredrick Leonard "Fred" Dirks. Fredrick Leonard "Fred" Dirks was born December 1, 1913, in Hancock Twp., Bon Homme Co., SD, and died January 30, 2001, in Yuma, Yuma Co., AZ, at age 87. Buried in Evergreen Memorial Gardens, Vancouver, Clark Co., WA. He is the son of Benjamin F. "Ben" Dirks of South Dakota and Anna Schmidt of South Dakota. Fredrick Leonard "Fred" Dirks and Olive Sophia (Nelson) (Goodman) Lull were married September 3, 1988, in Yuma, Yuma Co., AZ. Fredrick Leonard "Fred" Dirks and Olive Sophia (Nelson) (Goodman) (Lull) Dirks had no children. 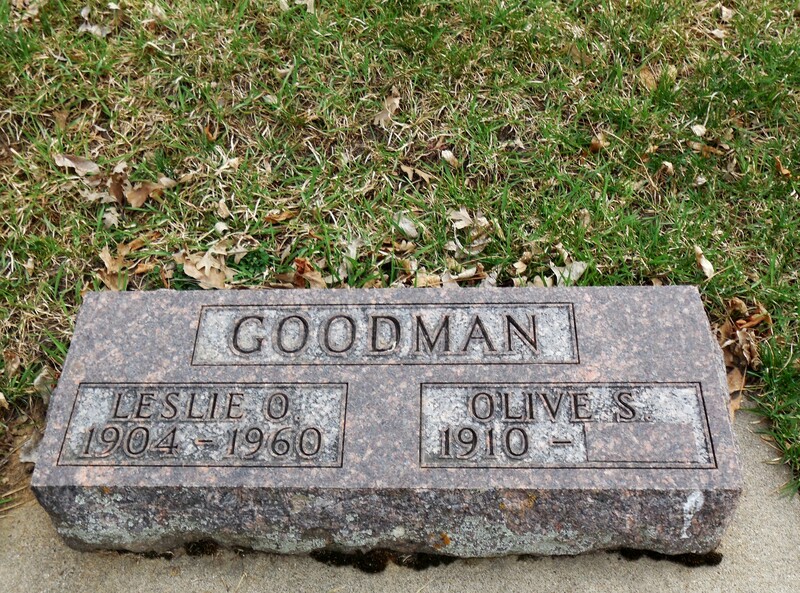 Leslie Osman Goodman is buried in Bear Butte Cemetery, Sturgis, Meade Co., SD. Olive is not buried there. Thanks to Find-A-Grave for making this image available. LeRoy Lloyd Lull and Francis (May) Lull are buried in Beulah Cemetery, Beulah, Crook Co., WY. Thanks to Find-A-Grave for making these images available. Fredrick Leonard "Fred" Dirks and Olive Sophia (Nelson) (Goodman) (Lull) Dirks are buried in Evergreen Memorial Gardens, Vancouver, Clark Co., WA. Thanks to Find-A-Grave for making this image available. Darril Eugene Goodman is buried in Mountain View Cemetery, Lordsburg, Hidalgo Co., NM. Thanks to Find-A-Grave for making this image available. The 1900 U. S. Census taken on June 1900 shows Herman Lull (age 23) born June 1877 in Wisconsin to Wisconsin-born parents is a Farmer renting his farm and is living in Manchester Pct., Boone Co., NE. Living with him is his wife of 2 years, Mary A. Lull (age 19) born October 1880 in Nebraska to Wisconsin and Massachusetts-born parents. 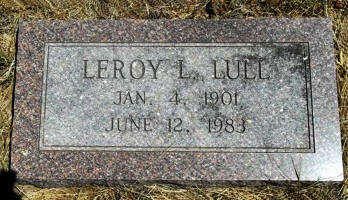 LeRoy Lloyd Lull was born January 4, 1901, in Albion, Manchester Pct., Boone Co., NE. 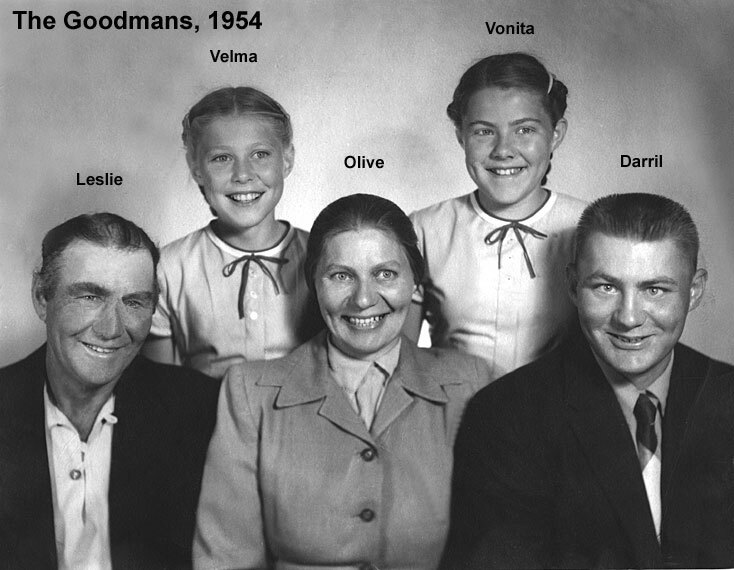 Leslie Osman Goodman was born March 26, 1904, in Lyons, Burt Co., ND. Olive Sophia Nelson was born March 8, 1910, in Dixon Twp., Gregory Co., SD. 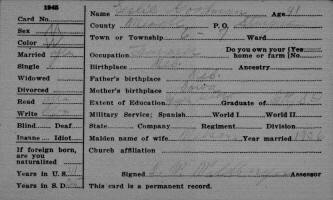 The 1910 U. S. Census taken on May 3, 1910, shows Clarence C. Nelson (age 31) born in Illinois to Swedish-born parents is a general farmer owning his farm in Dixon Twp., Gregory Co., SD and has been married 10 years. Living with him is his wife, Edith C. Nelson (age 27) born in Wisconsin to Swedish-born parents, and has all five of the children born to her still alive. Also living there are his children: Myrtle C. Nelson (age 8) born in Illinois; Hazel M. Nelson (age 7) born in Illinois; Paul E. Nelson (age 5) born in Illinois; Fern E. Nelson (age 2) born in South Dakota; and Olive S. Nelson (age 1/12) born in South Dakota. The 1910 U. S. Census taken on April 15, 1910, shows John J. Goodman, Jr. (age 31) born in Nebraska to Indiana and Maine-born parents is an unmarried General Farm Farmer renting his farm in Goose Lake Twp., Charles Mix Co., SD. Living with him is his married brother, Jessie M. Goodman (age 29) born in Nebraska to Indiana-born parents, who is a General Farm Laborer. Also living there is his married sister-in-law of six years, Alice Goodman (age 25) born in Iowa to Illinois and Iowa-born parents, with both of the children born to her still alive. 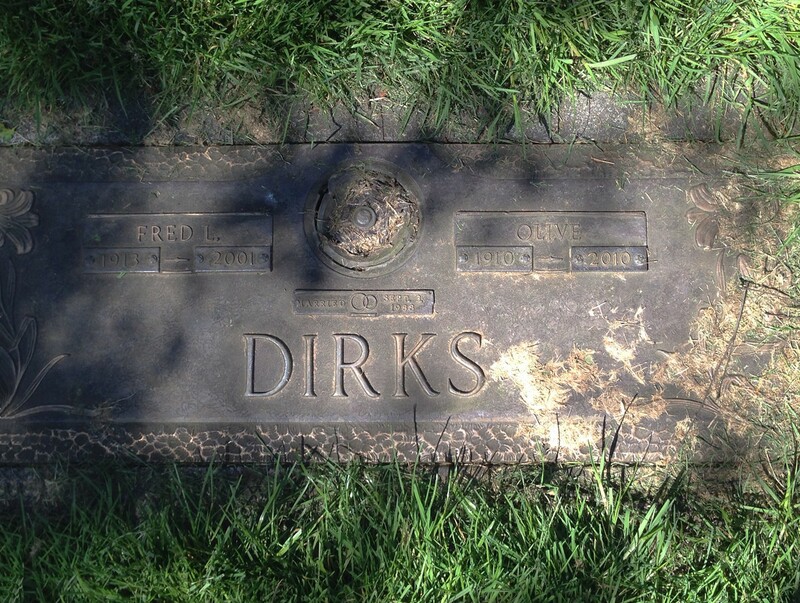 Fredrick Leonard "Fred" Dirks was born December 1, 1913, in Hancock Twp., Bon Homme Co., SD. The 1920 U. S. Census taken on January 13, 1920, shows Clarence C. Nelson (age 41) born in Illinois to Swedish-born parents is a Farmer owning his own farm and living in Dixon Twp., Gregory Co., SD. Living with him is his wife Edith C. Nelson (age 36) born in Wisconsin to Swedish-born parents. Living with them are their nine unmarried children, born to Illinois and Wisconsin-born parents: Myrtle K. Nelson (age 18) born in Illinois who is a Rural School Teacher; Hazel M. Nelson (age 17) born in Illinois; Paul E. Nelson (age 14) born in Illinois; Fern E. R. Nelson (age 12) born in South Dakota; Laurel V. Nelson (age 9) born in South Dakota; Walter R. Nelson (age 4-7/12) born in South Dakota; Violet T. Nelson (age 1-7/12) born in South Dakota; and Norman N. Nelson (age 1/12) born in South Dakota. Clarence C. Nelson was the census enumerator. The 1920 U. S. Census taken on February 5, 1920, shows Jesse M. Goodman (age 39) born in Nebraska to Indiana and Maine-born parents is a General Farm Farmer renting his farm in Jackson Twp., Charles Mix Co., SD. Living with him is his wife, Alice P. Goodman (age 34) born in Iowa to Illinois and Iowa-born parents. Also living there are his three children, all born to Nebraska and Iowa-born parents: Leslie O. Goodman (age 15) born in Nebraska; Elonora B. Goodman (age 12) born in Iowa; and Emmett A. Goodman (age 7) born in South Dakota. An unmarried Farm Laborer also boards in the household. The 1920 U. S. Census taken on January 20, 1920, shows Herman Lull (age 42) born in Wisconsin to United States-born parents is a Farmer and is living in Albion City, Manchester Pct., Boone Co., NE. Living with him is his wife, Mary A. Lull (age 39) born in Nebraska to Massachusetts and Wisconsin-born parents. Also living there are his three unmarried children, all born to Wisconsin and Nebraska-born parents: Lloyd L. Lull (age 19) born in Nebraska, a Farm Laborer At Home; Vera D. Lull (age 10) born in Nebraska; and Doris G. Lull (age 3-10/12) born in Wyoming. The 1920 U. S. Census taken on January 9, 1920, shows Ben F. Dirks (age 34) born in South Dakota to Russian-born parents is a General Farm Farmer renting his farm and is living in Hancock Twp., Bon Homme Co., SD. Living with him is his wife, Anna Dirks (age 32) born in South Dakota to Russian-born parents. Also living there: his adopted daughter, Bertha Dirks (age 8) born in Kansas to Kansas and United States-born parents; his son, Fredrick Dirks (age 6) born in South Dakota to South Dakota-born parents; and his son, Marion Dirks (age 6/12) born in South Dakota to South Dakota-born parents. 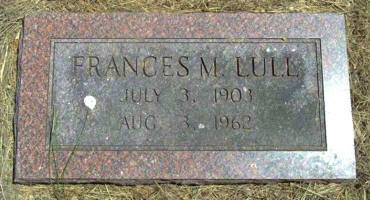 Paul Emil Nelson and Elnora B. Goodman were married January 26, 1929, in Tripp Co., SD. The 1930 U. S. Census taken on April 2, 1930, shows Clarence C. Nelson (age 51) born in Illinois to Swedish-born parents and first married at age 21 is a Farmer owning his own farm and living in Dixon Twp., Gregory Co., SD. Living with him is his wife Edith C. Nelson (age 36) born in Wisconsin to Swedish-born parents and first married at age 17. Living with them are six of their children, all unmarried and born in South Dakota to Illinois and Wisconsin-born parents: Fern E. R. Nelson (age 22) who is a Rural School Teacher; Olive S. Nelson (age 20) who is a Rural School Teacher; Laurel V. Nelson (age 18); Walter R. Nelson (age 14); Violet T. Nelson (age 11); and Norman N. Nelson (age 10). 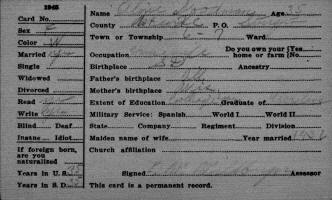 Clarence C. Nelson was the census enumerator. The 1930 U. S. Census taken on April 19, 1930, shows Jesse M. Goodman (age 49) born in Nebraska to Indiana and Maine-born parents and first married at age 22 is a General Farm Farmer renting his farm in Jackson Twp., Charles Mix Co., SD. Living with him is his wife, Alice Goodman (age 44) born in Iowa to Ohio and Iowa-born parents and first married at age 18. Also living there are his two unmarried sons, both born to Nebraska and Iowa-born parents: Leslie Goodman (age 26) born in Nebraska, a Farm Laborer; and Emmett Goodman (age 17) born in South Dakota. The 1930 U. S. Census taken on April 4, 1930, shows Leroy L. Lull (age 29) born in Nebraska to Wisconsin and Nebraska-born parents, and first married at age 25, is a Grain and Stock Farmer who rents his farm, and is living in Jenkins Twp., Crook Co., WY. Living with him are: his wife, Francis Lull (age 27) born in Missouri to Missouri-born parents, and first married at age 23; and his son, Martin V. Lull (age 2/12) born to Wyoming to Nebraska and Missouri-born parents. The 1930 U. S. Census taken on April 5, 1930, shows Ben F. Dirks (age 44) born in South Dakota to Russian-born parents and first married at age 23 is a General Farm Farmer owning his farm and is living in Hancock Twp., Bon Homme Co., SD. Living with him is his wife, Anna Dirks (age 42) born in South Dakota to Russian-born parents and first married at age 20. Also living there: his adopted daughter, Bertha Dirks (age 18) born in Kansas to United States-born parents, who is unmarried and absent; his son, Fredrick Dirks (age 15) born in South Dakota to South Dakota-born parents; his son, Marion Dirks (age 10) born in South Dakota to South Dakota-born parents; his son, Herbert Dirks (age 7) born in South Dakota to South Dakota-born parents; his daughter, Ruby Dirks (age 3) born in South Dakota to South Dakota-born parents; and his unmarried sister-in-law, Lena Schmidt (age 36) born in South Dakota to South Dakota and Russian-born parents, who is a Christian Church Clergyman. 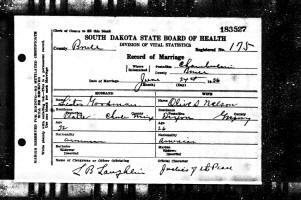 Leslie Osman Goodman and Olive Sophia Nelson were married June 24, 1936, in Chamberlain, Brule Co., SD. 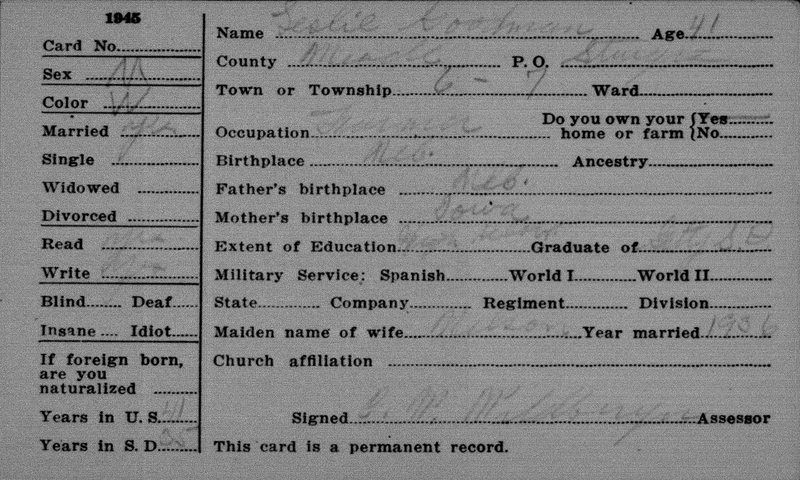 Leslie Osman Goodman and Olive Sophia Nelson Marriage Record. The 1940 U. S. Census taken on April 12, 1940, shows Leslie O. Goodman (age 36) born in Nebraska, and 5 years ago was living in Charles Mix Co., SD, and with 4 years of High School, is a married Farmer of a Farm who rents his farm worth $800 and is living in Iona Twp., Lyman Co., SD. Living with him are: his wife, Olive S. Goodman (age 30) born in South Dakota, and 5 years ago was living in Charles Mix Co., SD, and with 1 year of College; his son, Darril E. Goodman (age 2) born in South Dakota; and his daughter, Marjorie V. Goodman (age 5/12) born in South Dakota. The 1940 U. S. Census taken on April 10, 1940, shows Alice Goodman (age 54) born in Iowa, and 5 years ago was living in South Dakota, and with 8 years of School, is a widowed Head of Household, and is renting her home for $6/month, and is living in Platte, Platte Twp., Charles Mix Co., SD. Living with her is her unmarried son, Emmit Goodman (age 27) born in South Dakota, and 5 years ago was living in South Dakota, and with 8 years of School, a Laborer on a W. P. A. Dam Project. The 1940 U. S. Census taken on April 20, 1940, shows Le Roy Lull (age 39) born in Nebraska, and 5 years ago was living in Crook Co., WY, and with 1 year of College, is a married Truck Driver for the U. S. Mail, and who owns his home worth $600 is living in the Town of Sundance, Crook Co., WY. Living with him are: his wife, Frances Lull (age 37) born in Missouri, and 5 years ago was living in Crook Co., WY, and with 8 years of School, a Clerk at a Bakery; and his son, Martin Lull (age 10) born in Wyoming, and 5 years ago was living in Crook Co., WY, and with 2 years of School. The 1945 South Dakota State Census U. S. Census taken in 1945 shows Leslie Goodman (age 41) born in Nebraska to Nebraska and Iowa-born parents, and married in 1936 to a Nelson, is a Farmer renting his farm, and with 4 years of High School, is living in Townships 6 - 7, P. O. Box Sturgis, Meade Co., SD. 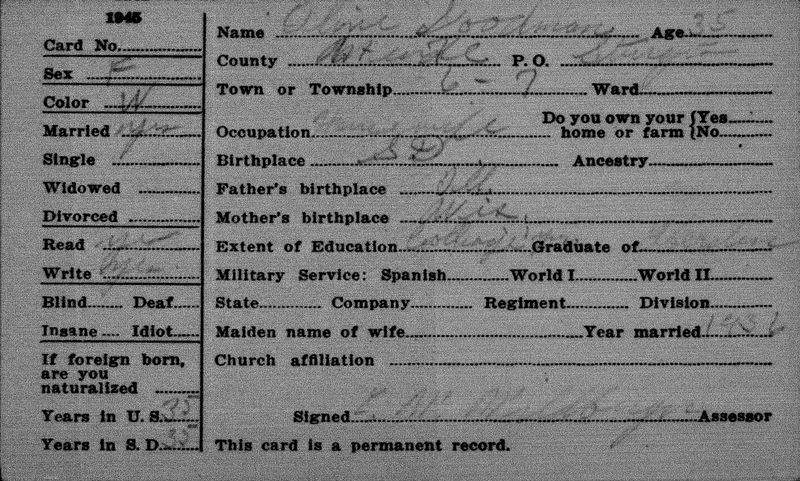 The 1945 South Dakota State Census U. S. Census taken in 1945 shows Olive Goodman (age 35) born in South Dakota Illinois and Wisconsin-born parents, and married in 1936, is a Housewife with Teachers College education, and is living in Townships 6 - 7, P. O. Box Sturgis, Meade Co., SD. 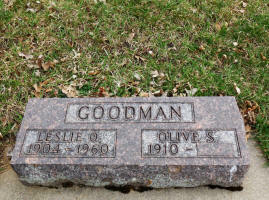 Leslie Osman Goodman died January 17, 1960, in Rapid City, Pennington Co., SD, at age 55. Buried in Bear Butte Cemetery, Meade Co., SD. Following the death of Leslie Osman Goodman, Olive Sophia (Nelson) Goodman married LeRoy Lull on April 25, 1963, in Tonasket, WA. 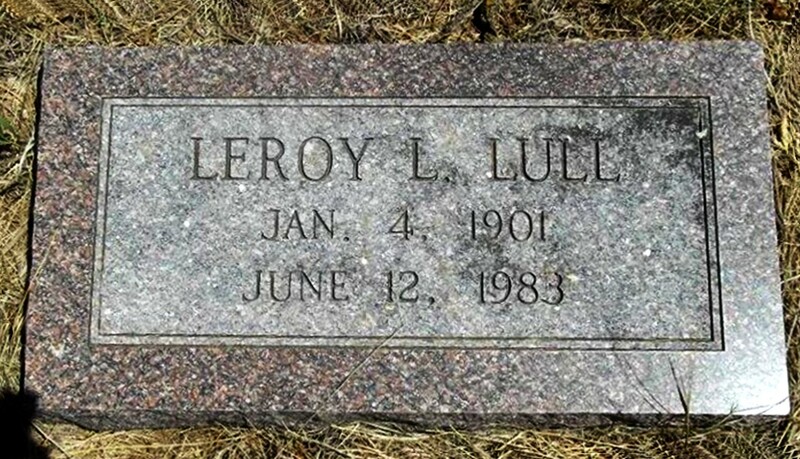 LeRoy Lloyd Lull died on June 12, 1983, in Yuma, Yuma Co., AZ, at age 82. Buried in Beulah Cemetery, Beulah, Crook Co., WY. Fredrick Leonard "Fred" Dirks died January 30, 2001, in Yuma, Yuma Co., AZ, at age 87. Buried in Evergreen Memorial Gardens, Vancouver, Clark Co., WA. 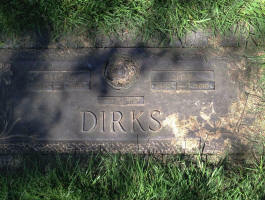 Fred Leonard Dirks, 87, died Jan. 30, 2001, in Yuma, where he resided in winter. He spent the past 12 summers in the Vancouver area. Mr. Dirks was born Dec. 1, 1913, in South Dakota. Survivors include his wife of 12 years, Olive, at home; two stepdaughters, Vonita Davidson of Portland and Velma Fraley of Ferndale, Wash.; one stepson, Darril Goodman of Lordsburg, N.M.; one brother, Herbert Dirks of Warden, Wash.; and two sisters, Charlotte Jarman of Peever, S. D., and Bertha McLean of Redondo Beach, Calif. The casket will be open 9 a.m. to 9 p.m. today and Friday. A funeral will begin at 12:30 p.m. Saturday at Memorial Gardens Funeral Chapel. Burial will be in Evergreen Memorial Gardens Cemetery. 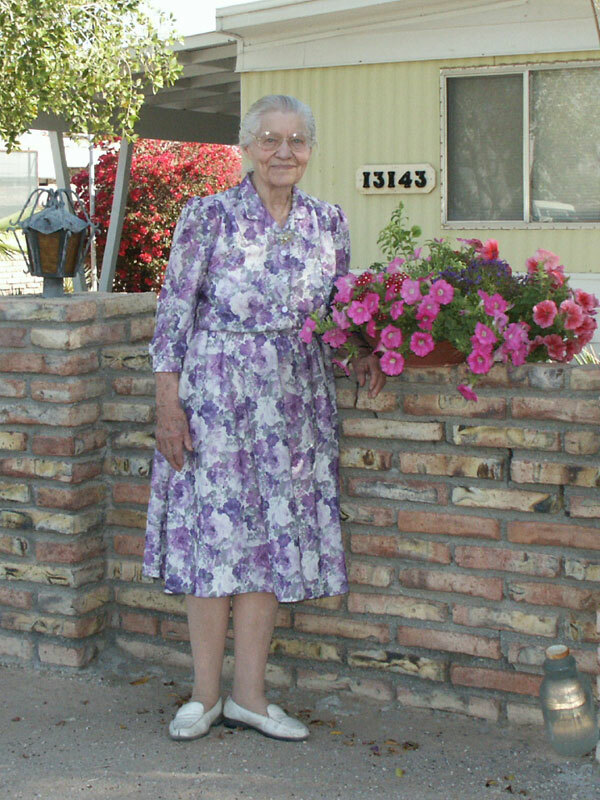 Olive Dirks at age 92, at home in Yuma, AZ, March 28, 2002. Leigh Larson visited cousin Olive on March 28, 2002. Olive Sophia (Nelson) (Goodman) (Lull) Dirks died September 7, 2010, in Ferndale, Whatcom Co., WA, at age 100. Buried in Evergreen Memorial Gardens, Vancouver, Clark Co., WA. Olive S. Dirks, 100, passed away at her home in Ferndale, WA, on Sept. 7, 2010. Services will be held in Vancouver, WA. Local arrangements are by Moles Family Funeral Homes - Ferndale. Olive S. Dirks, 100, a former resident of Yuma, died Sept. 7, 2010, in Ferndale, Wash. She was born March 8, 1910, in Dixon, S.D., and was a teacher. Funeral services will be 12:30 p.m. Sept. 18 at Evergreen Memorial Gardens Funeral Chapel in Vancouver, Wash.
Olive S. (Goodman: Lull) Dirks, 100, a former resident of Sturgis, died Sept. 7, 2010, in Ferndale, Wash. She was born March 8, 1910, in Dixon, S.D., and was an educator in the Sturgis area for many years. She is survived by her daughters Velma Fraley of Ferndale, WA; Vonita Davidson of Portland, OR and Son Darril Goodman, Sr. of Yuma, AZ and 11 grandchildren; 21 great grandchildren and numerous nieces, nephews and cousins. Funeral services will be held Saturday, September 18, 2010 at 12:30 p.m. at Evergreen Memorial Gardens Funeral Chapel, Vancouver, WA. 360-892-6060. Ellis Green and Edna Ruth Owens were married April 8, 1971, in Warrensburg, Johnson Co., MO. Darril Eugene Goodman died October 23, 2012, at Gila Regional Hospital, Silver City, Grant Co., NM, at age 75. Buried in Mountain View Cemetery, Lordsburg, Hidalgo Co., NM. ALSO, WAS MARRIED TO SARAH KAMALANG'ONBE GOODMAN. YOU ARE MISSED BY ALL YOUR LOVED ONES. NOW THAT YOU PERCEIVE WHAT YOU COULD NOT WHILE HERE, I AM GRATEFUL YOU CAME INTO MY LIFE. REST IN ETERNAL PEACE! SOMEDAY WE'LL BE TOGETHER. Edna Ruth (Robertson) (Hix) (Owens) (Green) Goodman died October 3, 2002, at Gila Regional Medical Center, Silver City, Grant Co., NM, at age 68. Buried in Mountain View Cemetery, Deming, Luna Co., NM. Daily Democrat, Clinton MO, Oct 7 2002 - Edna "Ruth" Goodman, 68, Lordsburg, New Mexico, died Thursday, October 3, 2002, at Gila Regional Medical Center in Silver City, New Mexico. Graveside services at Mountain View Cemetery, Deming, New Mexico, will follow the funeral services at the Assembly of God Church. She was born August 18, 1934, in Warrensburg, to Henry and Edna Hall Robertson. 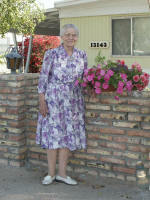 She moved to Lordsburg in 1979 from Missouri and was a homemaker and had also worked as a cashier for E. J. Short Company. 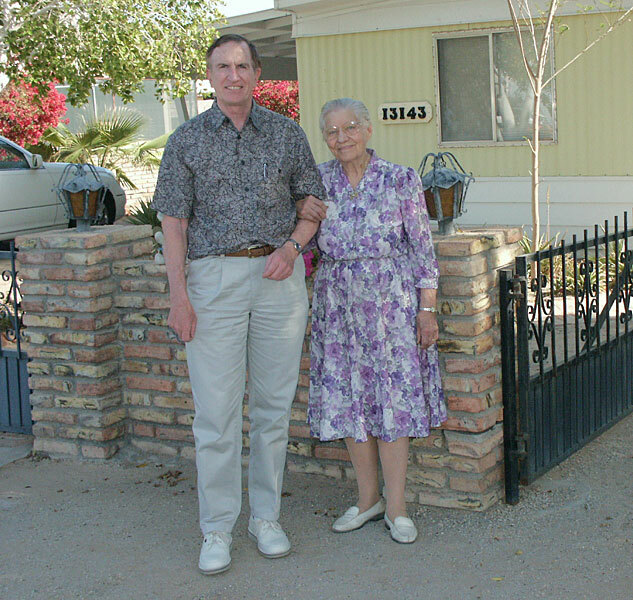 She is survived by her husband, Darril E. Goodman, Sr. of Lordsburg; one sister, Fay Deardorff of Warrensburg; eight children, Donald Hix and wife Gloria, Benton, Keith Hix and wife Sherry, Merriam, Kansas, Kenneth Hix and wife Michelle, Independence, William David Hix and wife Lydia, Silver City, Janice Wood and husband Ralph Bayard, Annamarie Ramirez and husband Manuel, Lordsburg, Mary Pantoja and husband Ruben, Casa Grande, Arizona, and Jeanni Hall and husband Kevin, Silver City; three stepchildren, Leslie Goodman and wife Sandra, Lordsburg, Darril Goodman, Jr. and wife LaWanda, Phoenix, Arizona, and Emmitt Goodman, Lordsburg; 31 grandchildren, two great-grandchildren and many nieces and nephews. Edna "Ruth" Goodman, 68, Lordsburg, N.M., died Thursday, Oct. 3, 2002, at Gila Regional Medical Center in Silver City, N.M.
Mrs. Goodman was born Aug. 18, 1934, in Warrensburg, Mo., the daughter of Henry and Edna (Hall) Robertson. She lived in Missouri until moving to Lordsburg in 1979. She was a homemaker and had worked as a cashier for the E.J. Shorty Co. for some time. Her survivors include her husband, Darril E. Goodman Sr., Lordsburg; a sister, Fay Deardorff, Warrensburg; eight children and their spouses, Donald and Gloria Hix, Benton, Mo., Keith and Sherry Hix, Merriam, Kenneth and Michelle Hix, Independence, William David and Lydia Hix, Silver City, Janice and Ralph Wood, Bayard, N.M., Annamarie and Manuel Ramirez, Lordsburg, Mary and Ruben Pantoja, Casa Grande, Ariz., and Jeanni and Kevin Hall, Silver City; three stepchildren, Leslie Goodman and wife, Sandra, Lordsburg, Darril Goodman Jr. and wife, LaWanda, Phoenix, and Emmitt Goodman, Lordsburg; 31 grandchildren; two great-grandchildren; and many nieces and nephews. Services were today at the Assembly of God Church. Burial was in Mountain View Cemetery. Arrangements were under the direction of Baca's Funeral Chapels, Deming, N.M.
Ellis Green died died Monday, April 5, 1995, at Gila Regional Medical Center, Silver City, Grant Co., NM, at age 68. Buried in Mountain View Cemetery, Lordsburg, Hidalgo Co., NM.